This recipe came about not so much as an accident but as an act of frugality and conservation. A few years ago when I was moving to Michigan, I was trying to ensure that as little as possible went to waste, so after I had packed up everything I could for the movers to take and given away to friends whatever they could use, I was left with a rather random assortment of things and food items. 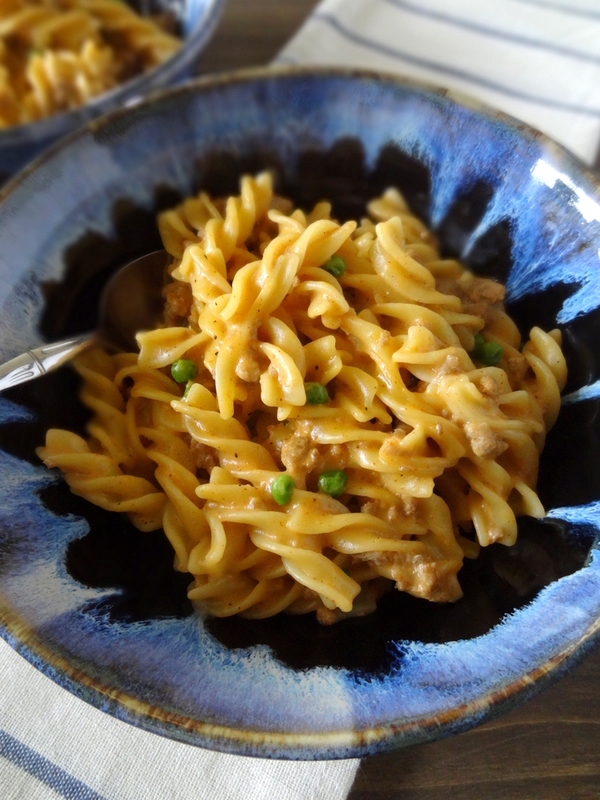 The main things I had left to use up were milk, ground turkey, frozen peas, pasta, and a bit of cheddar cheese, so I combined all these things into what I was nearly certain was going to be a highly unfortunate confluence of just plain weird. Much to my delight, I was wrong. It was actually incredibly tasty and satisfying. 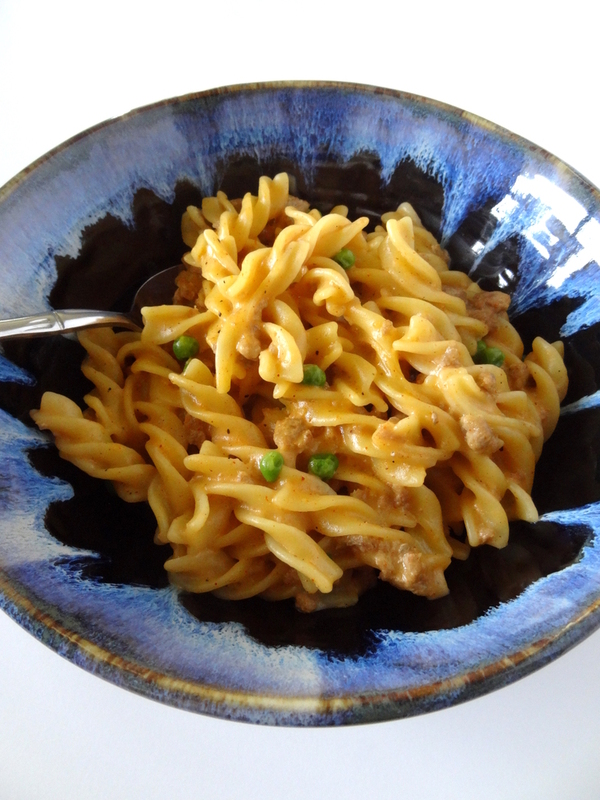 Fast forward a few years to a couple weeks ago, when I had a bunch of leftover pasta, no more leftover spaghetti sauce, some ground turkey that has been in the freezer since June (I often forget that the freezer is not, in fact, a food immortalizer), and no will to go to the store. I remembered my pre-relocation hodge-podge meal and decided to recreate it, and threw in some chili powder and leftover tomato soup for good measure. The result? 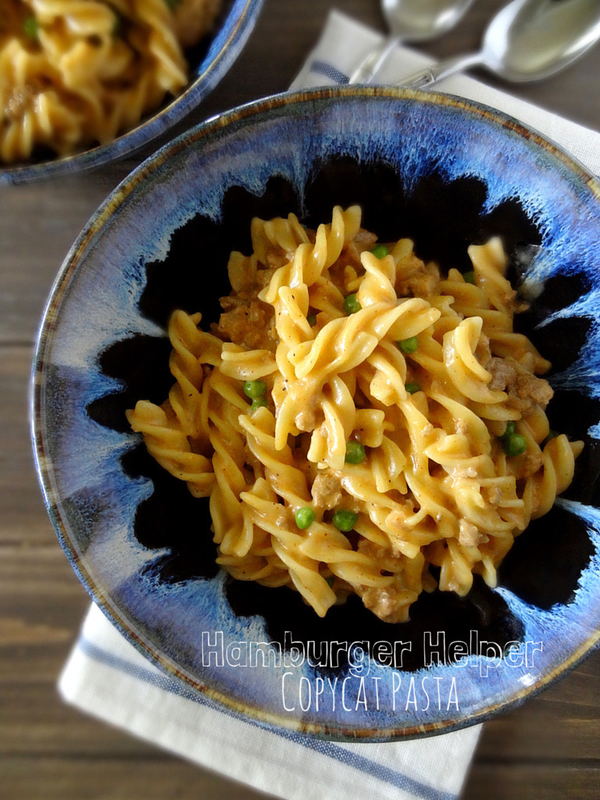 Essentially, a homemade version of Hamburger Helper! Well, except that I used turkey, but you could easily swap in some ground beef if you prefer. 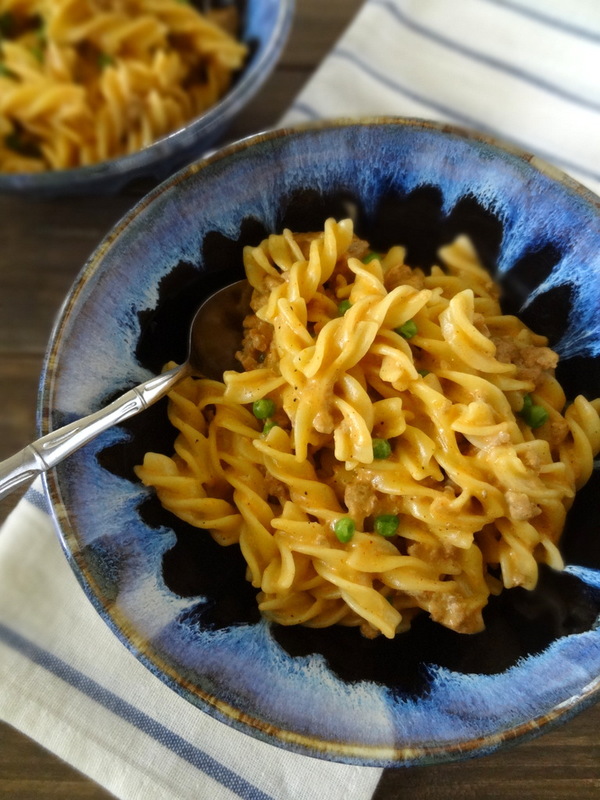 Not quite as heavy as most macaroni and cheese recipes, this Hamburger Helper copycat still satisfies that craving for a hearty, cheesy pasta dish, and is sure to be a winner with kids! In a skillet, cook the ground turkey until no pink remains, breaking it into small, bite-sized pieces. While the turkey is cooking, boil water for pasta, adding 1 teaspoon of salt to the water, and cook the pasta according to the directions on the package. 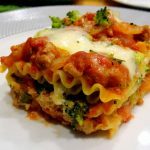 In a medium saucepan, whisk together the flour and vegetable oil. Heat on medium until small bubbles appears. Stir in the milk (microwaving it for a minute before adding will help reduce cooking time) and tomato soup. Add the remaining salt (1 teaspoon), pepper, and chili powder. Cook on medium until the sauce thickens slightly, about 5 minutes. Add the grated cheddar cheese and stir until incorporated. Once the pasta is done, drain and return it to its pot. 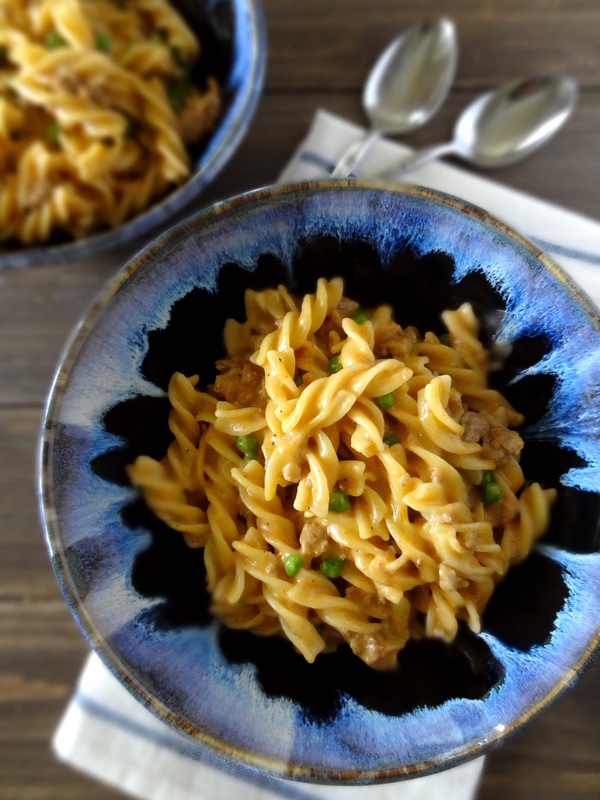 Combine the pasta with the sauce, cooked ground turkey, and peas. I’ve made this both with Campbell’s tomato soup and with Trader Joe’s organic creamy tomato soup. I prefer the one with the Trader Joe’s version, but pretty much any tomato soup you have on hand will do. A family friend recently made this absolutely stunning set of glazed ceramic bowls for me – I am in love with these bowls! If you happen to be in southeastern Michigan and you are looking for some pieces (plates, bowls, serving pieces, gift items, and more! ), you can find some of her pottery at Starring the Gallery in Northville, MI. She is also a member of the Village Potters Guild, which has sales twice a year. If you are interested, you can also send me a message and I’ll put you in touch with her directly! Aren’t these bowls gorgeous?! I’m horrified to learn that a freezer is not a food immortalizer. I’ve been using it wrong all these years and this explains so much. I love the resourcefulness of this meal! 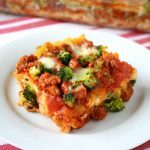 So many of my favorite recipes are just a mishmash of things that need to be used up that somehow become magic when thrown together. Love that you use turkey instead of beef. And those bowls are amazing! Made this the other day and I really liked it! This is on track to become one of my favorites, especially with the cold winter approaching. Excellent – I’m glad to hear it! 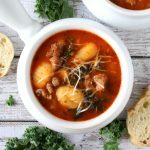 Question: condensed tomato soup? 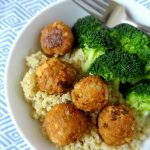 I try to have cooked ground meat in recipe-portions in my “time-machine” freezer. That way, I can make a one pot meal in short time. This sounds tasty! Good question – if you’re using condensed soup, add the specified amount of water *before* measuring out one cup. The one cup of soup should be soup in its ready-to-eat form. That’s a handy idea to freeze ground meat that is already cooked, rather than still raw. I’ll have to start doing that!